Roasted sweet potatoes are a comforting and yummy treat whatever the weather, perhaps even surpassing the traditional roastie found next to your Sunday beef and Yorkshire puds. And there’s perhaps only one thing which could make this even more of a perfect tummy-warmer on a gloomy Wednesday: being served by a jolly little dog with a welcoming smile and the most precious little paws you ever did see. Yep. 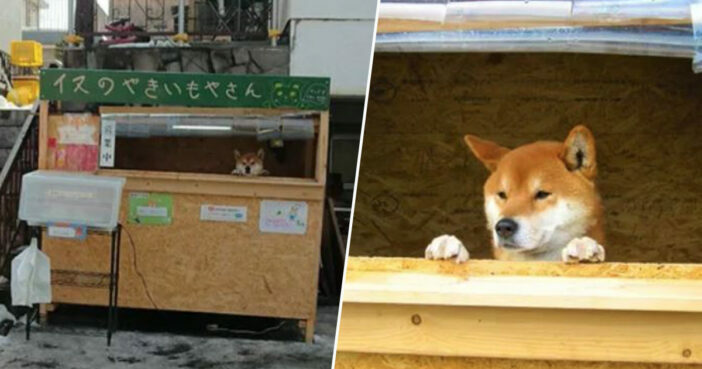 A roasted sweet potato store in Hokkaido, Japan is actually staffed by a dedicated canine entrepreneur, who’s channeling his good boy skills into getting that bread. If you’re strolling around in the residential area of ​​Kiyota-ku, Sapporo City, you may well come across Ken-kun, a three-year-old shiba inu/shop manager. Ken-kun mans (dogs?) the counter of a small self-service restaurant by the name of ‘犬の焼き芋屋’ (which, in English, translates helpfully as ‘A Baked Potato Shop’). At first, it looks like there is no one, and when someone approaches it, the face is put out like that. Whenever a customer comes by, Ken-kun pops his adorable little head over the counter to greet them, no doubt barking the praises of his paw-fect potatoes. Customers serve themselves of course, due to Ken-kun’s unfortunate lack of opposing thumbs. They open a white box at the front of the store and pop the money in a hole. Although this is a unique and arguably ‘experimental’ dining experience, it’s actually fairly affordable. You can get a tatty for 100 yen (69p). Adding and subtracting not being Ken-kun’s strong point, you’ll not be able to get change. If you overpay, then this money will – quite rightly – go towards keeping canny Ken-kun rolling in biscuits. With Ken-kun being such a cuddly looking pup-rieter, you’d be forgiven for thinking he’s as soft as his strokable ears. However, thieves be warned: if you try and dash off without paying, he’ll run out and chase you. I was personally a bit rubbish during my own years in customer service, having the posture of a tortoise and a permanent resting hangover face.